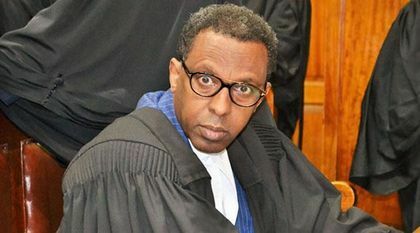 Wednesday April 3, 2019-Renowned city lawyer, Ahmednasir Abdullahi, has attacked Anti-Corruption Magistrate, Douglas Ogoti, for slapping Samburu Governor, Moses Lenolkulal, with a cash bail of Sh 100 million or a bond of Sh 150 million. The governor, who currently cooling heels at Industrial Remand Prison, was arrested on Tuesday over loss of Sh 86.4 million from his county. According to the prosecutions, the governor looted the money through Oryx Service Station which he owns. Now Ahmednasir, who is one of the most corrupt lawyers in Kenya’s bar, termed Magistrate Ogoti as incompetent and said he should be removed from office. “When a court of law sets bail at Ksh 100 million for Samburu Governor, it shows 2 things. 1. That the magistrates is plainly incompetent and must be removed from office or 2. He is playing to the public gallery and is thus not exercising decisional independence...@lawsocietykenya,” Ahmednasir said. However millions of Kenyans have celebrated the ruling saying it will serve as a lesson to many governors in Kenya who have formed a habit of stealing billions and using corrupt cartels in the Judiciary to evade justice.